Hotshot trailers for sale at Country Blacksmith Trailers in Mount Vernon and Carterville. We have the Lightest, Strongest Hotshot trailers in the industry! We stock a variety of high quality manufacturers of hotshot trailers including Delta, Diamond C, PJ, Load Trail, Country Blacksmith, Big Tex, and Kaufman. 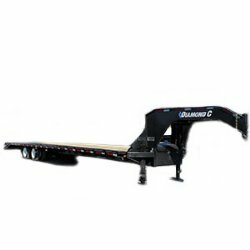 Our newest trailer in-stock is the Diamond C Fleetneck Engineered Beam Gooseneck Trailer. These cutting-edge trailers are lighter, stronger, and taller than a typical I-beam trailer and the beautiful arch in the frame to help with sagging. In addition, you will find great standard features including torque tub, fold out steps, LED lights and polyurethane finish. We are the largest dealer that stocks the Diamond C Fleetneck Engineered Beam in the Midwest! Do not forget to check out all our add-on features using our new product options, which will help you customize your trailer to your specific needs. Just check the options you want and then add to your cart! If you have any questions, give us a call or stop by our Carterville, IL or Mount Vernon, IL stores to talk to a trailer specialist!